BELLEVUE DENTISTRY Should Be Tailored for the Unique Needs of Each Patient. At our Bellevue Dentist Office, it would be nice if every patient that called us after a referral from a friend or after visiting our website fit into a cookie-cutter mold for dental services. Everyone would get the same dental work done at the same cost and, most importantly, they’d all see the same positive results and have the same beautiful smiles. An additional benefit to both the patients and dentists would be no hassle insurance, since the insurance companies would be paying the same amount for everyone. Many principles of Bellevue Dentistry apply across all, or most, dental practices and dental specialties. However, with so many unique variables and unique characteristics related to each dentist and their resulting dental work, the approach to dentistry will vary among different dentists. These variables as they are combined will result in a unique outcome for each dentist. Each dentist should work with each patient to customize the work required to reach the goals of each of their patients, which will always be unique. Each dentist must have the proper equipment and properly trained staff to deliver a high quality dental product to every patient. At Brookside Dental Bellevue, we expect to deliver the highest quality of dentistry that can be provided. We accomplish this by continually updating our technology and office, having highly trained and friendly staff members, and through continuing education classes taken by our dentists and staff members. We have an onsite porcelain artist to insure consistently high quality porcelain veneers and porcelain crowns. As Bellevue Dentists, we work with each individual person to customize the work required to reach the goals of each of our patients. Our Bellevue Dentist approach and treatment plan will always be unique for each person. Additional information regarding general family dentistry and cosmetic dentistry can be obtained at our Brookside Dental Bellevue website. 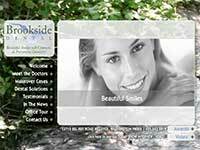 For examples of Bellevue Cosmetic Dentist recent cases VIEW BROOKSIDE DENTAL SMILE MAKEOVERS using various cosmetic dental techniques.